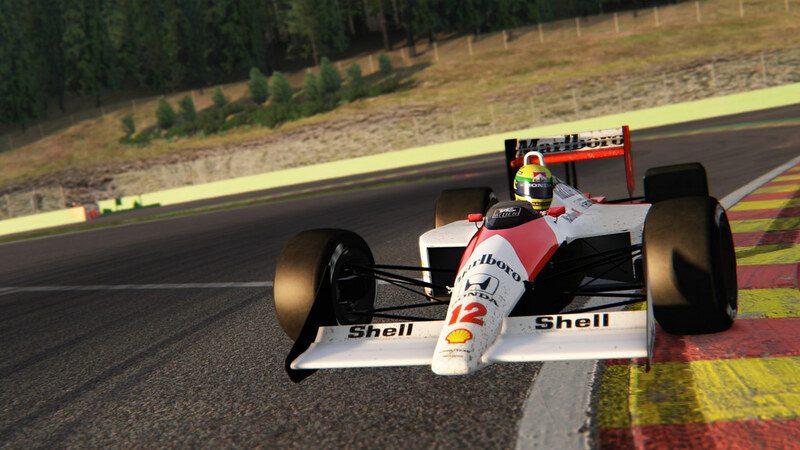 Continuing my custom made 1988 F1 Championship using Senna’s McLaren MP4/4. I qualified in pole position after what I considered is a god like lap. A bit slow off the start (I really need to work on that), but I was able to get the lead back easily and was managing the pace in front with no problems (a few cutting corners by accident here and there). 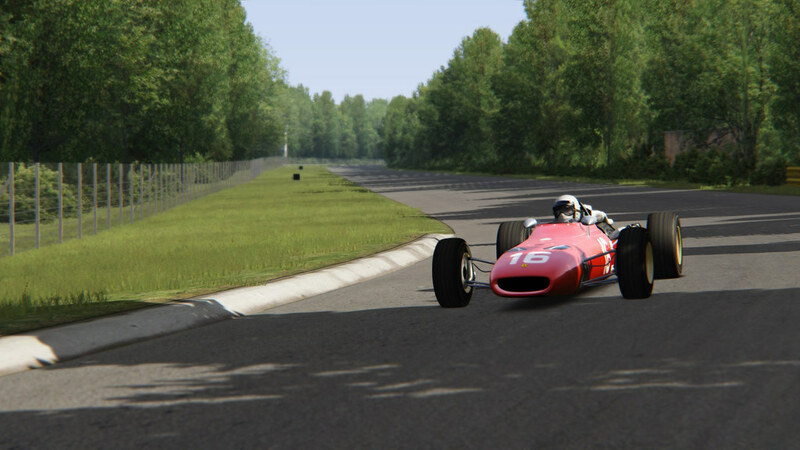 Sadly, this is where I noticed Assetto Corsa lacking in terms of the AI: AI backmarkers do not move out of your way or slow down as to not impeded the leaders. In fact, I got punted in lap 17 and lost my lead. Thus, a 3 lap race for the lead and win began. It was thrilling, but I was really mad at the AI. Also of note, this will be the last race for now that I run in 33% total race distance… I will be lowering it down for now at 25% total race distance. Follow me here or on the following sites! •Do you game? Add me on Steam! 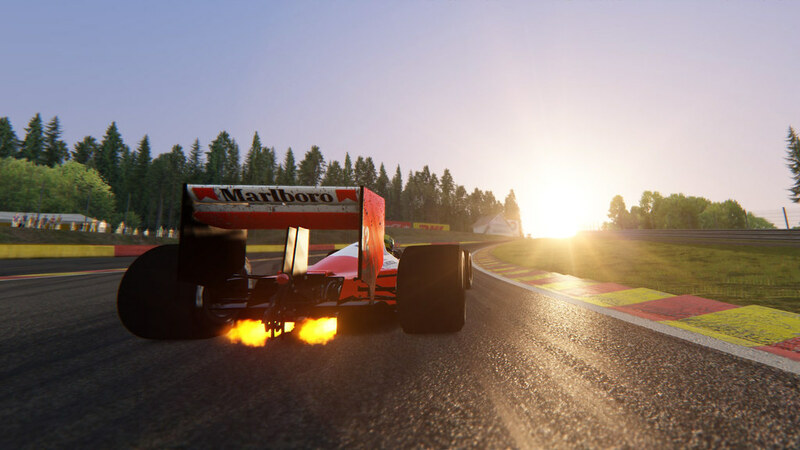 This is not going to be the bulk of my posts here in this site, but I’m starting a new series where I will play some racing sims and record them. 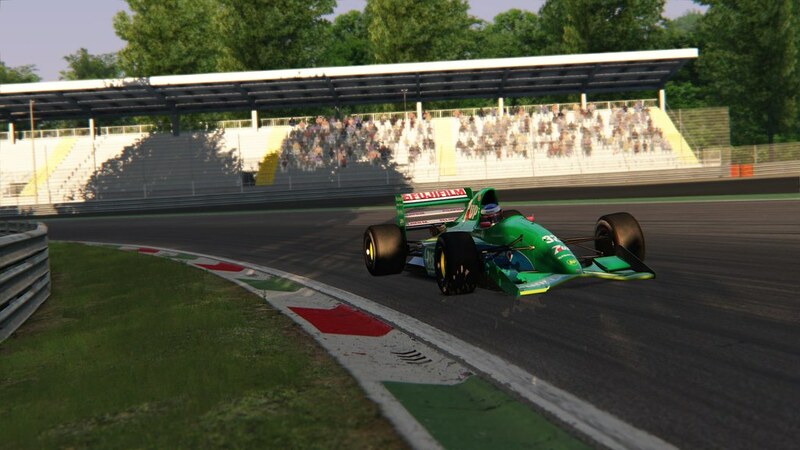 For this inaugural post in this brand new series of blogs, I will share the 1st round of my custom made 1988 F1 season… I might make a seperate post on how I made the custom mod and such, but for now, this post will have a video of the 1st round of the championship. 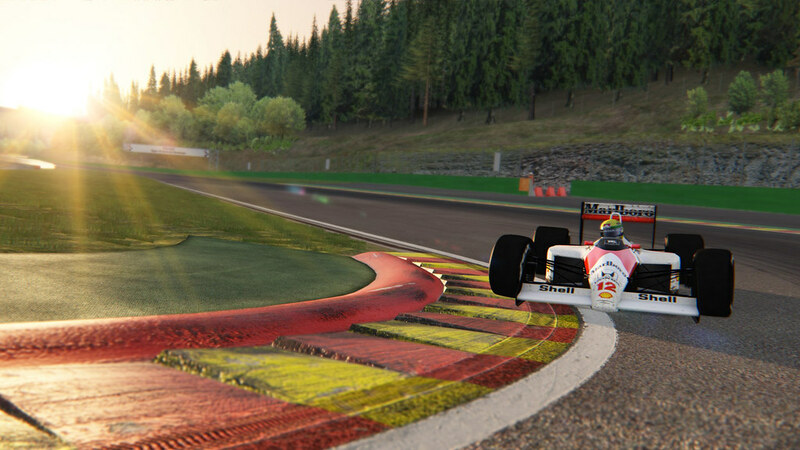 I am driving the McLaren MP4/4 opposite of Alain Prost for the 16 races in this season. After a hard fought qualifying, I ended up in 4th place in the grid. Had a decent start and worked my up to 2nd and was fighting for the lead. 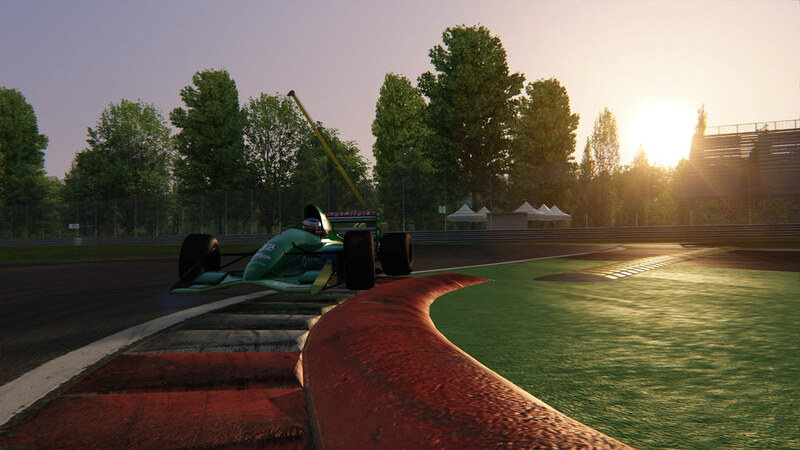 It was a good race for me as I was able to manage my tyres and fuel (no refuelling and tyres are expected to have at least 50% life at the end of the race thus pitting is very rare in 1988), but I got too greedy fighitng for the lead and in the penultimate corner of the 9th lap… well… you can just watch it. 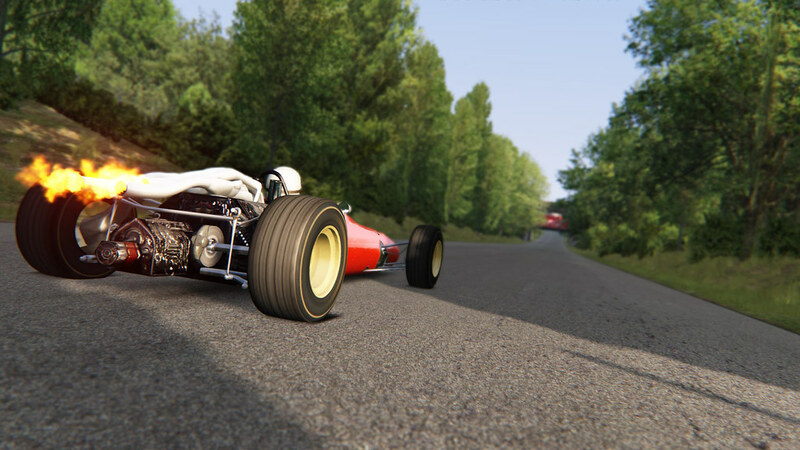 Here are just my quick thoughts on Assetto Corsa since it is almost like 2am here, but I’m just too psyched up not to talk about, or in this case, write about it. 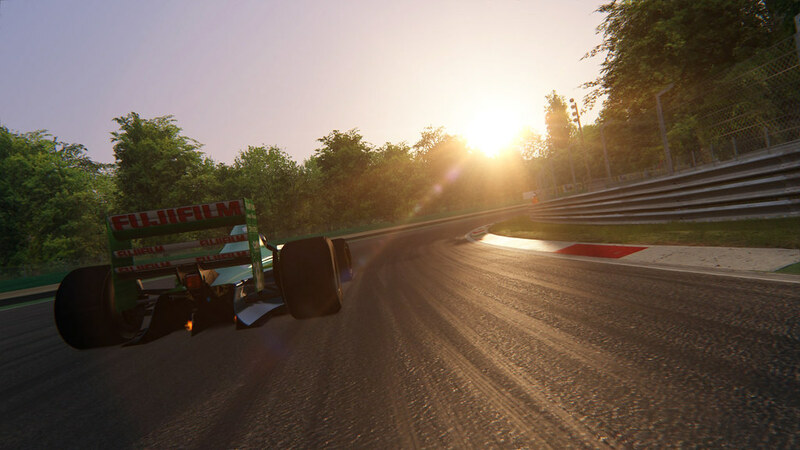 I have been a fan of motorsports, particularly Formula 1 (hereafter F1) for 21 years, and I have played my fair share of racing games, starting from the original Gran Turismo in the original PlayStation. 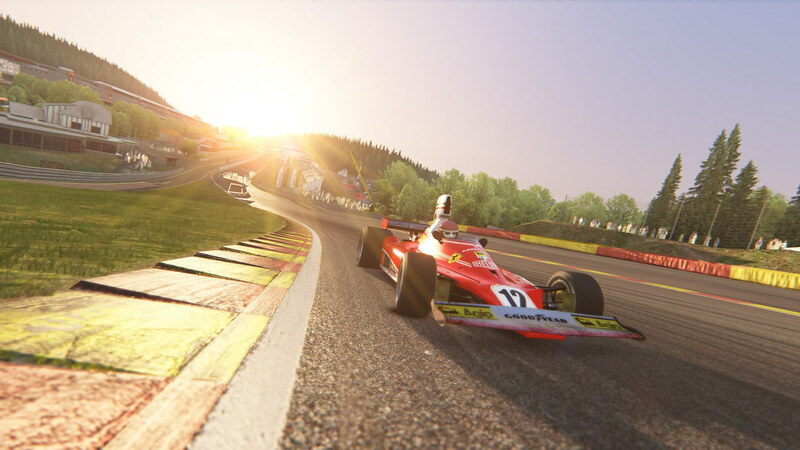 I am a Role Playing Game fan (hereafter RPG) even way before I got into racing games, or racing in general, and in the past few years, I have concentrated more on RPGs and a few shooters here and there; I have almost let go of the serious sim racing scene. 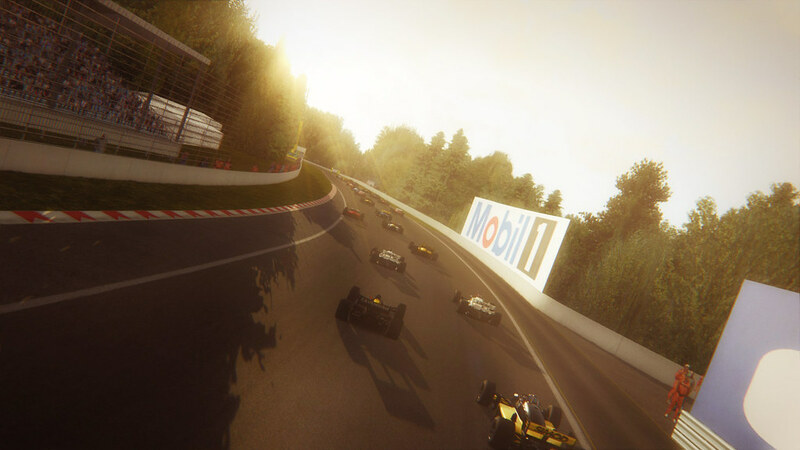 I say almost, cos I still do play some F1 sims every now and then, but it was not the same passion I had when I played Gran Turismo and such in the consoles back in the day. However, the past month or so, I was able to get a new sim racing wheel and pedals, along with a rig to hard mount the wheel/pedal without having to mount it on my desk each time I wanna play a racing title, and just a few weeks ago, I got a shifter for the rig so I can feel what it was like to race F1 cars, or any cars, but in the day without the sequential and paddle shifters. I have noticed the title, because even if I have lost sight of the sim racing scene, I am still subscribed to a lot of sim racing channels in YouTube, so I keep on seeing them talk or test mods and gear with Assetto Corsa. It is nowhere near perfect; I would change a lot of aspects of the game, but the thrill of modding the game with more cars and tracks (some of the mods are paid mods, and worth every penny, made by 3rd party modders, though I did also pick up the DLCs for the game), having to drive the F1 cars I respected thru the years, from the 60s to present (not all F1 cars are available to download of course, but at least the more famous cars thru the years are); it is interesting to see how each era had their own set of challenges to drive. My favorite car to drive thus far is the McLaren Honda MP4/4, a legendary F1 car known to many fans, even to us Ferrari fans. It is fun to drive using my 6 gear gated shifter, gives me the sense of all the work the drivers had to put into back in the day. 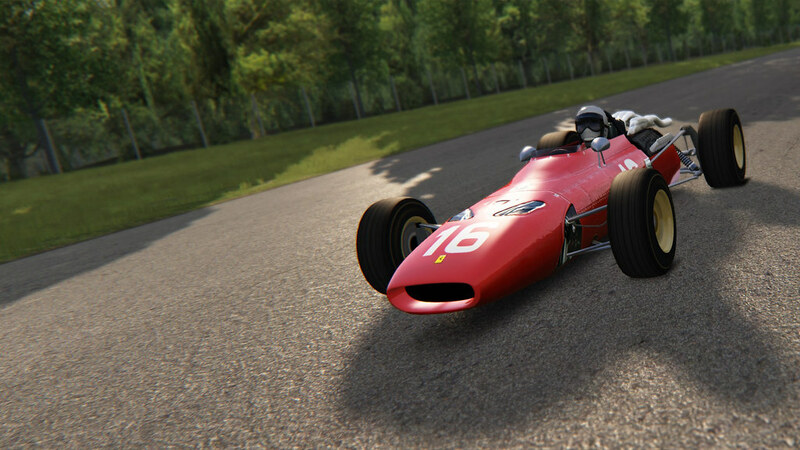 I ended up downloading 40 or so F1 cars, some paid, like I said, from 3rd party modders, but they are worth every penny. I will create another post with the links to each of my F1 mods and some pics of them. 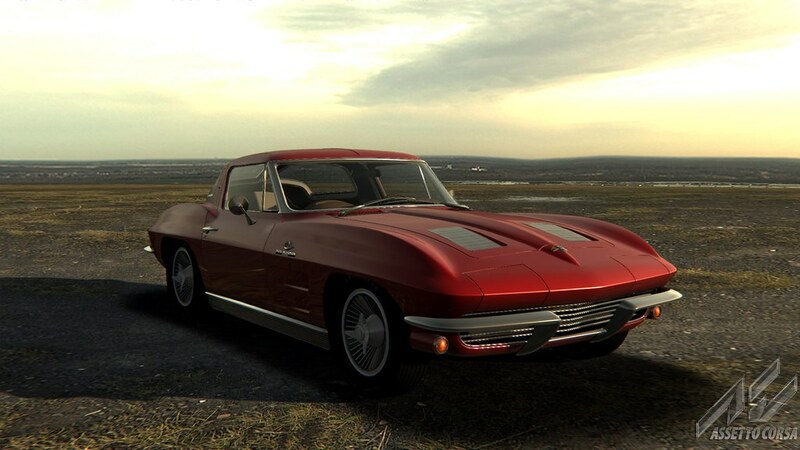 Of course, this game is multi-discipline, so there is more to this than just F1 (but boy oh boy, being an F1 fan, I race with F1 cars 90% of the time), I also happen to have downloaded American muscle cars, and my real life dream car, the 1963 Chevrolet Corvette C2 Stingray. This is my absolute dream car, because I feel this is more obtainable than, let’s say, a Ferrari. 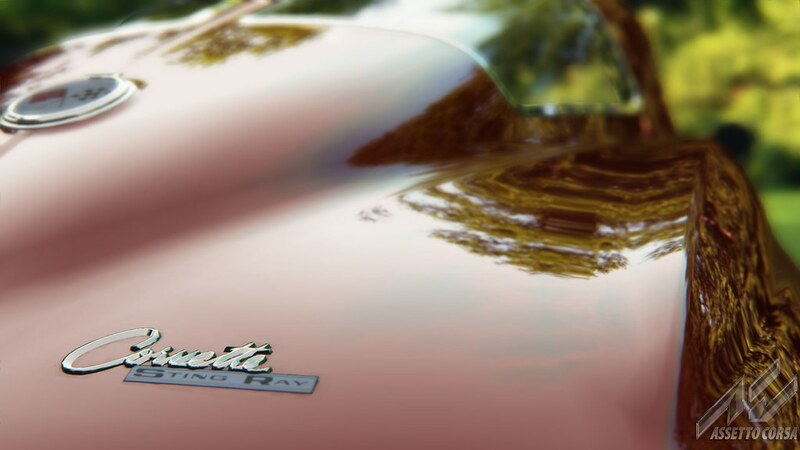 I also got my dad’s old 1966 Ford Mustang, which he sold when I was very young; ugh, I could have gotten a muscle car by now, but ah well… I still don’t know why he sold it to this day. Anyways, I also got the Mustang, showed it to my dad, got him to drive around with the sim racing rig, and it was just a fun gesture. Again, with the 12 muscle cars I got, I will post them in a different blog entry and where to download them and some pics as well. Truth be told, I have just been racing open-wheelers like F1 and have free roam driving with the Muscle cars… there are still the GT cars, the LMP cars, the rally cars, the drift cars, and the list goes on! Been putting in so many hours in this game just trying to clock the best time, get the right setup, just constantly beating my best time and perfecting every lap in and out; then racing with AI (cos, hell no! I am not good enough yet, to race online…) at 100% strength and variable amounts of aggressiveness (cos lets face it, the AI can lack the “I” and just punt you off the track), racing in the classic era F1 cars with manual gated shifters, just give me the thrill and passion I once had when I was younger and totally into racing sims. Again, this game is FAR from perfect, but I’m glad that it is actively being developed, always improving, and with an open community, their mods can make it way better. I will share some of my favorite photos I got in game which were edited a bit with Photoshop here and there. Interesting to note as to why I got so eager to give my quick thoughts on this (I won’t even proofread this) is because I managed to recreate the 1988 F1 season in game; sure I wasn’t able to use the Jacarepagua circuit that hosted that year’s Brazilian GP (the track mod lacked the desired number of pit boxes) having replaced it with Interlagos circuit and some of the team’s livery were based on the 1984 skin pack (I will link all these in the future), but I managed to edit some of the liveries to match “enough” of the cars of the 1988 season. I originally was able to download and edit up to 24 of the 28-30ish cars of that season, but thanks to Paul Ricard’s and Monza’s 1988 track mods having a 21 pit box limit, I removed the Leyton House March 881 cars and the AGS JH23 car (I was choosing the AGS JH23 or the Osella FA1L, of course, I would rather keep a car that has fail written all over it for laughs… which is quite fitting as the Osella FA1L only participated in 10 of the 16 races, having retired in 5 of those 10 races, also on the 6 races it didn’t participate in, it was disqualified in 1, did not qualify in 2, did not pre-qualify in another 2, and didn’t participate at all in 1… I digress). And with that! I am done with my quick thoughts! It is almost 3am at the end of this post… so maybe it wasn’t so much of a quickie… meh. 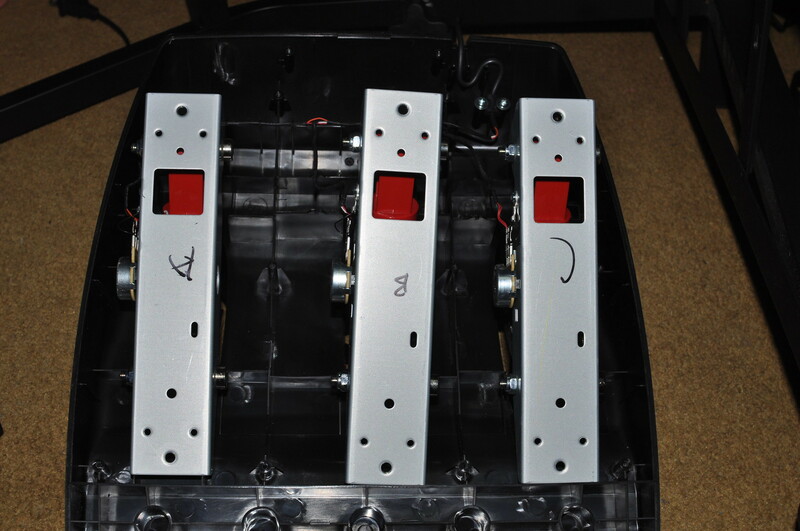 SimRig Update: More Pedal Mods! 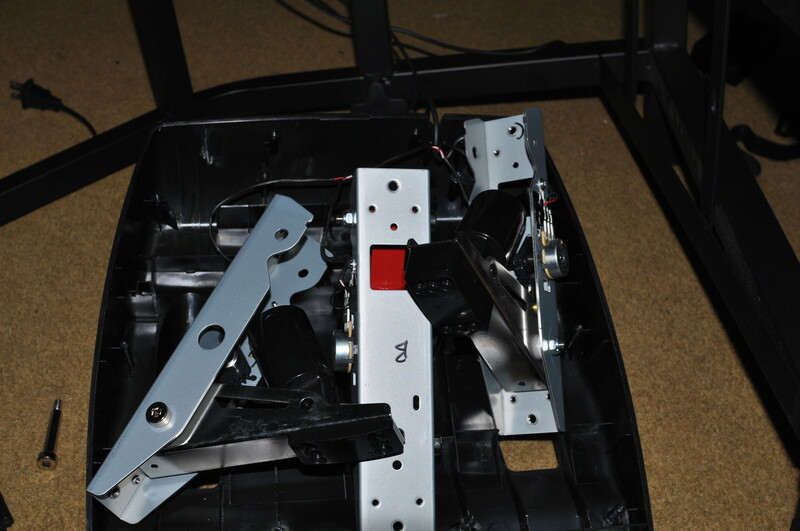 In my previous post about finally building a Sim Racing Rig, I mentioned that I modded the brake pedal by removing the rubber stopper/block that Logitech put in order to simulate progressing brake tension, but the design was poorly thought out as the rubber block/stopper, made it next to impossible to brake fully. Thus I decided to remove it. 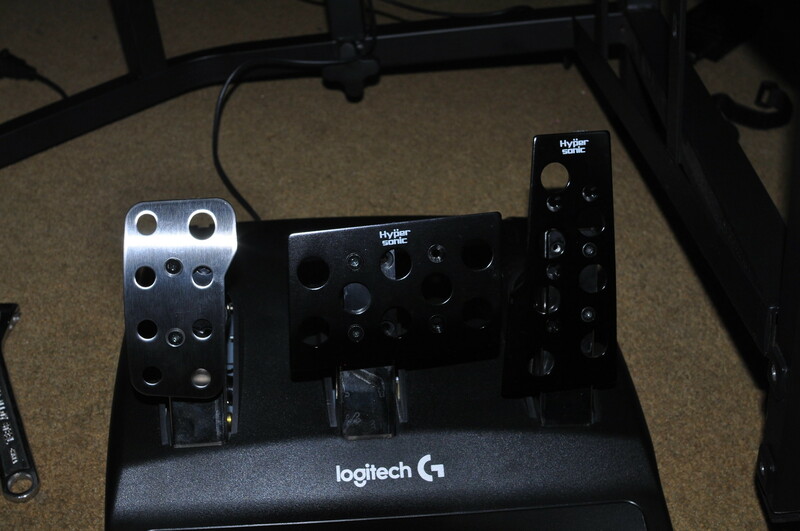 Not satisfied with such a simple mod, I wanted to make the Logitech G920 pedals feel a lot better and a lot more responsive, especially in the throttle; I felt the throttle spring is too light and have fine control of throttle a little bit tricky. 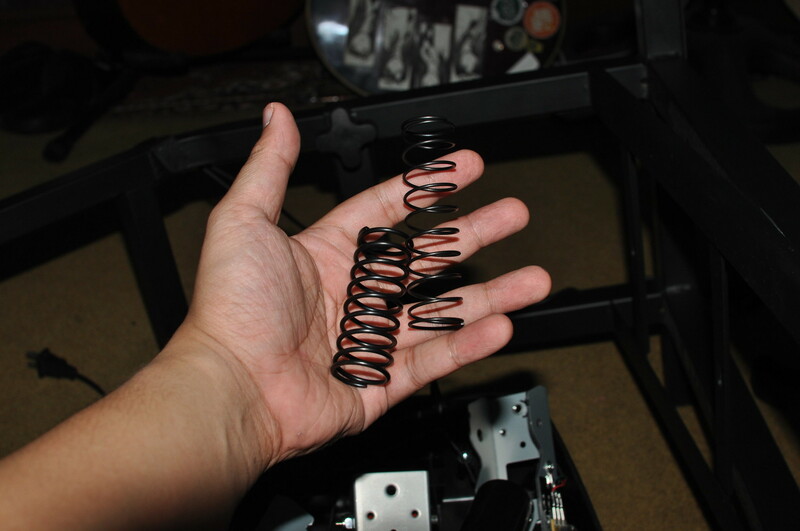 I also found the stock face plates of the pedals didn’t really feel comfortable as the are a bit too tiny, especially in the throttle, thus I decided to be on the lookout for after market pedal face plates. 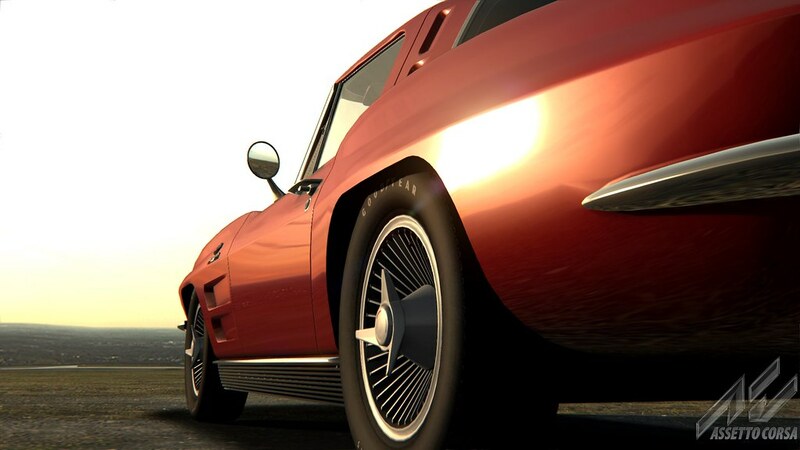 Thankfully, as is with most racing wheels for simulators, they are nearly identical to real life counterparts, so you may use after market parts for real cars in the racing wheel and pedals. 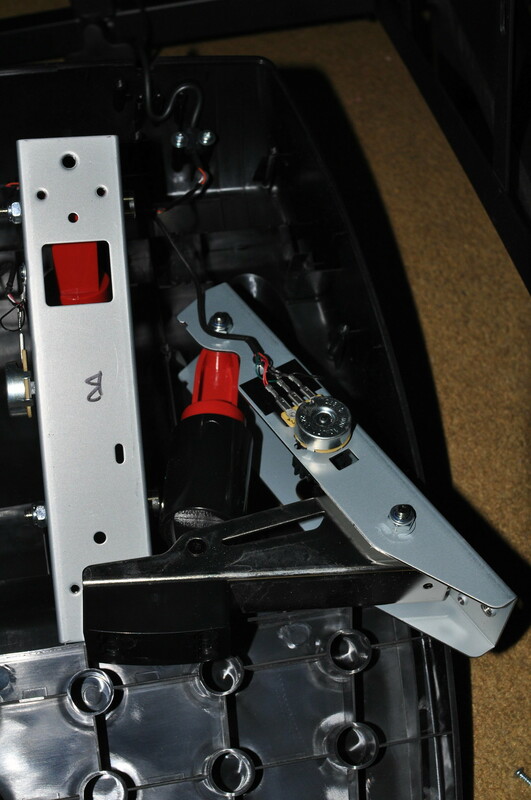 I found a cheap enough pedal set, with a long enough throttle to feel comfy and a large enough, rally style brake face plate, that can make it easy for me to do heel toe braking if I need to (which I don’t need so much in F1 games), and it being large enough, makes it very comfortable to brake. I then decided to switch the stock clutch face plate with the stock throttle face plate, since I bought the after market face plates without the clutch; the stock throttle face plate is large enough for the clutch in my opinion. 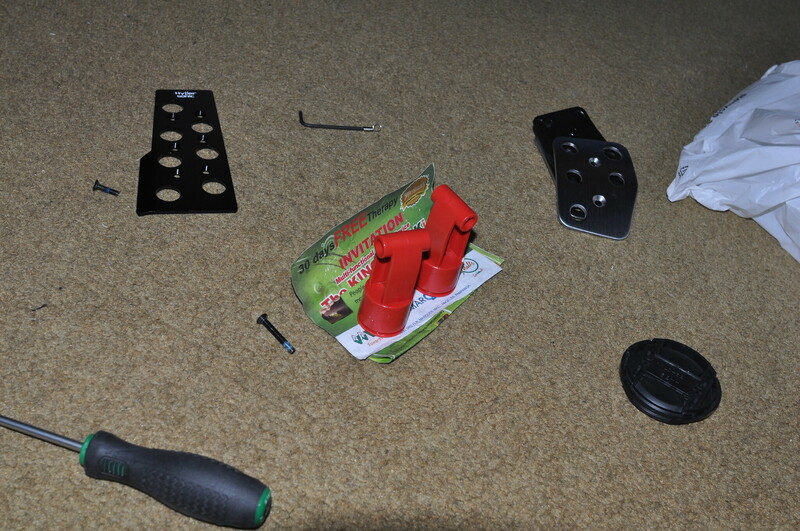 New pedal face plates for the brake and the throttle; used the stock throttle face plate for the clutch. I was just having a quick drive around Monaco where my best time with my personal car setup was a 1:19.231 (I am not the greatest sim racer out there; others easily get 1:13.00s) and shattered it, while not driving really seriously, with a 1:18.897. So, yeah, it was worth it. What is my next project for the SimRig? 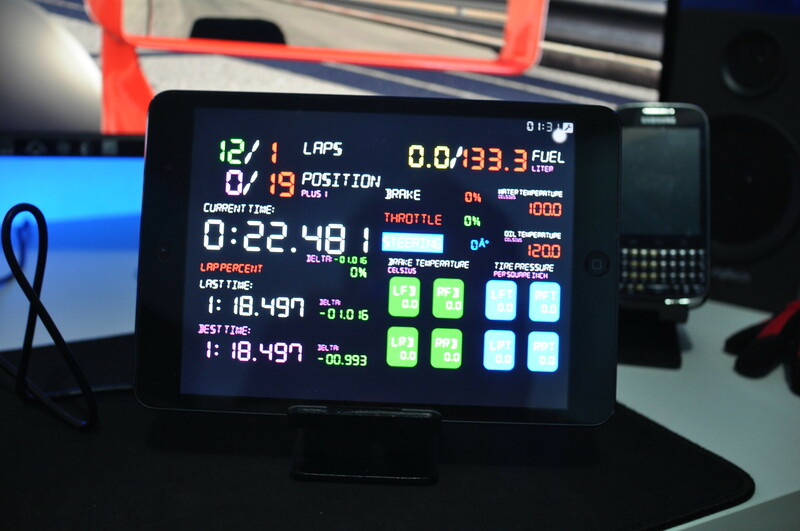 I do wanna make 2 dedicated sim dash devices so I don’t always have to use my iPad mini and my Zenfone 2; plus I get to program exactly how I want them to look and what telemetry to collect using readily available programs intended for Arduino. Though I won’t be doing it anytime soon as I don’t have so much time for such projects just yet. But it will happen sometime. Do you game? Add me on Steam! It has been a trying weekend to say the least; had to go to work in what should be my days off on the weekend, started to develop body malaise and chills, then got a call last night to help my mom go to a hospital as she was having chest pain. The latter with my mom, for me, as a physician myself, looked like a regular GERD, but I still wanted her to have an ECG as well as cardiac markers just to be sure and we all decided to have her admitted to have a repeat ECG and cardiac markers after 10-12 hours. My sister, a physician as well, who happens to be on duty in the hospital last night made it easy for me to leave my mom at her care in the hospital last night. I didn’t go back to my work (I was supposed to be 24 hours duty) so I went back home to nurse myself as I was coming down with something bad. I was really having chills, body malaise, and severe headaches. No amount of my usual pain killers can relieve my headache. I was this close in getting admitted myself. Waking up to the same bad headache and chills as I went to sleep with, I decided to have a CBC with platelet count as I was visiting my mom in the hospital anyway. It was weird making a request for myself and not for my patients. As all that was happening, I was supposed to hang out with one of my best friends who decided to visit the Philippines after years of not being around here. Sadly, work, my current condition, my mom being admitted, didn’t really help us hang out. However, he did visit me at work once and he even dropped by my mom’s hospital room to visit her as well. I was happy enough to see my best friend I haven’t seen in years, but he dropped a bomb on me. In a good way. We were once talking about geeky stuff and I mentioned that I saw something at the Fan Gamer site: it was a Megaman E Tank Mug, and I thought it would be cool to have it as I would most likely be the only one here in the Philippines to have it. This makes it easier for me at work to know if the mug is really mine or not. And to stop people from trying to use it without my permission. I was wondering why he was so hellbent on giving me my “pasalubong”; as he kept on trying to give it to me days prior to today, I was starting to presume that maybe, just maybe, he got me the mug that we were once talking about. Lo and behold, he appears with a USPS box with a 2 day priority mail label on it. I started to lean towards my hypothesis that he did in fact get me the mug. After he left my mom’s room, I was looking at the box more intently and saw it was from Fan Gamer! And the item inside was in fact the E Tank Mug! Having gone home as my CBC was normal and my mom was discharged (her tests are normal, too) I was eager to open up my care package. A USPS care package!? From Fan Gamer!? And look at the bottom, it says “EMug”!? COULD IT BE!? I like opening packages from the bottom, and this greeted me. OKAY! It is the E Tank Mug!! The E Mug is protected very well and I got a free random rubberized coaster; this coaster is inspired by the classic Megaman/Rockman Password screen! And here she is! Much like how the E tank fills up Megaman’s health/energy, with this E Mug my energy will be filled by way of coffee! Having my CBC test normal, my mom being discharged, and getting this, all those combined made my otherwise bad weekend into a good weekend. Can’t wait to clean this up and start using it. I love coffee, I love video games, and I love the classic Megaman series. This was the perfect gift someone like me can ever have. And to get it as a surprise from my best friend, made it all the while better (even if I already had a small idea what it was since he kept bugging me to get my pasalubong and the box had all the clues). It is the little things that make you smile. Yes I pretending to drink from E Mug… It wasn’t clean yet lol. And yes, my favorite color is blue. For those interested in getting this, click here! It will lead you right to the E Mug in Fan Gamer’s site! When System Shock Enhanced Edition was first announced for GoG, I was happy yet saddened because it wasn’t immediately released for Steam, my preferred platform, I had to wait a month for it to be available in Steam. But I knew the wait will be worth it. And when it finally hit Steam a few days ago, I didn’t hesitate to purchase it right then and there, plus with a 20% off at that time, I was all the more willing to buy it. System Shock was one of those DOS games that stay with you… and with it’s sibling, System Shock 2, it gave me, a computer geek who likes tinkering with programming languages, who is in love with the thought of the future and the technology it promises, together, those two games threw in a cyberpunk universe, filled with all the tech I want, the feeling of being a cool cyberpunk hacker that can also wield a gun or two, puzzles that only computer geeks will really appreciate (anyone can solve them, they aren’t too hard, but a computer geek will see the tiny details that make them smile), and a lot more. 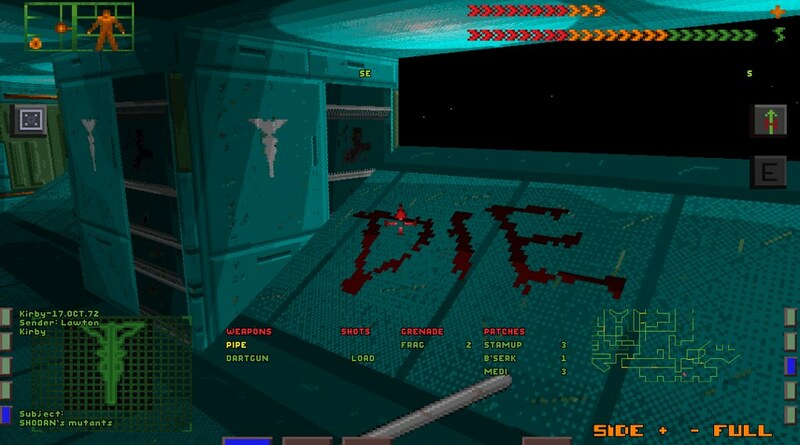 Both games stuck with me, but if we are talking about DOS games that I will forever love, it is System Shock. Playing it nowadays, however, is hard even with DOSBox; I have gotten so used to mouselook controls, or simply, modern PC first person controls. SO, having to replay it is difficult. Plus no support for higher resolution doesn’t make things any better. System Shock 2, has modern controls, and has mods to make it look better than it did when it first came out, so there was no problems ever replaying it. So, when the Enhanced Edition mentioned that it had support for higher resolutions (albeit 1024×768 max, but you can add a custom resolution…), mouselook, and key remapping, I was certainly happy with it. I was reading a lot these past few days so I didn’t immediately play the game as soon as I bought it; I just started last night, and to my surprise and delight, the keybinding, mouselook sensitivity, and custom resolutions were not in the in game menu. I had to go to the games .ini and .cfg files and edit it. I LOVE THAT! 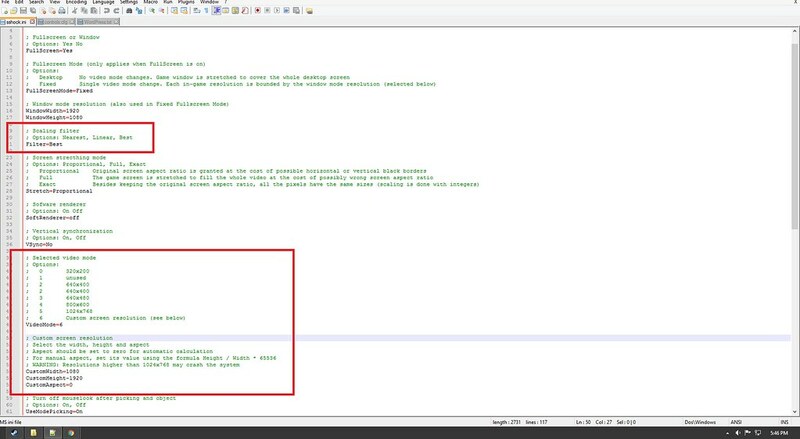 Editing the controls.cfg using Notepad ++ just to change key bindings. I love it! 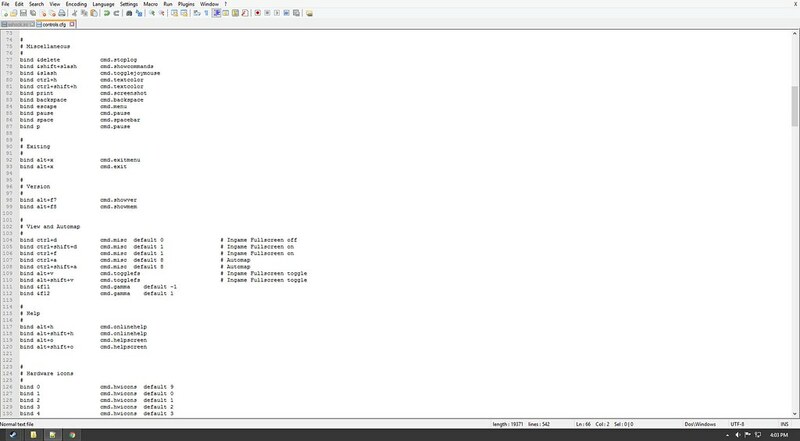 Like I said, I am a tinker, I love using Visual Studios or even simple as Notepad++, play around with C++, Obj C, JAVA, etc; I love modding my games, I love editing my regedit, etc; so when something as simple as changing the key bindings, the mouse sensitivity, etc, one needs to open .ini or .cfg files, I go gaga over it. It fits the game perfectly! The key remapping is a Godsend because, I use a Logitech G600; I can simply bind the key of certain controls for the game for my mouse and I don’t have to lift my fingers of the main movement keys (WASD… you know). It’s these little things that, we take for granted, but if you have the right peripherals, it means the world to you; yes I can bind keys for my mouse to match the default keys of the game, but that entails me making a new profile in Logitech’s program, and sadly, that program only has a limited amount of profiles to be saved… sure, I can export and import, but all the hassle… editing the .ini or .cfg may also be a hassle, but it is only done once, and it feels WAY better that way. In game screen grab; as you can see, I changed the resolution to 1920×1080 and used the Best Filter… it looks easier on the eyes. Another screen grab; same resolution and filter. Textures are better. Last screen grab in game; same resolution and filter. The one downside with using higher custom resolutions, apart from the possibility of crashing, is the words in the dialogue/data box are spaced at really wide to accommodate the higher resolutions. For the resolution, the max is 1024×768, way better than the DOS at 320×200; but you can use a custom resolution, also found in the sshock.ini file. Be wary, any resolution higher than 1024×768 may cause the game to crash at certain points. Also the videos in the game will not be stretched to whatever resolution you choose. Just something to take note of. This is a complex game in terms of controls; there are so much on the screen, and so much controls to know. Something as simple as crouching will has 3 separate buttons. There is, like its sibling, have a sense of momentum when running or even just walking; that is to say, if you run straight, and let go of the controls, you character will slow down to a stop gradually, like in real life… not an immediate stop. Something, again, to take note of. Overall, it is a great Enhanced Edition for those additions. Having to be able to play this on modern systems is enough incentive to play this game honestly, but those tiny additions makes the biggest difference. It still has the same tension that it gave me when I was a young boy, and to see it next to my copy of System Shock 2 in Steam, makes my heart warm. Add my BioShock collection, then the collection is complete… for now. I happy with what the guys at Night Dive Studios did to bring this to modern systems. READ CAREFULLY, I said, modern systems, not modern age per se. That means, it is still, in all it’s pixelated glory, left in tact and will not please those “graphics buffs” out there, it is not perfect for the modern age of gaming. Even with the additions to make it easier to play today, it still won’t be loved by newer generations, only those who have fond memories of this game. But it will run smoothly on modern systems. And with that, if you remember this game, played the second game, a bit curious, and RPG/FPS fan, or whatever, DO PICK THIS UP! It is available in GoG and Steam! Still 20% in Steam at the time of this writing. If you want to purchase it in GoG, CLICK HERE! If you want Steam, like I do, CLICK HERE! Now it is time for me to return to Citadel. All visual content featured on this website are copyrighted to their respective rightful owners. No infringement intended. If you own rights to any of the images and do not wish them to appear on this site, please contact me here to promptly remove upon receipt of notification. Great Time To Be a Classic PC Gamer! I have been playing PC games since the DOS days, I bet if I were to have been born a lot earlier, I’d be playing games on the computer a lot earlier, too. But alas, I was born on 1989 and was able to play DOS games in the tail end of its run before Windows fully took over. That being said, I have played a lot of classics, like Wolfenstein 3D, Doom, Quake, etc. Another game during that era was a little game entitled System Shock. I was too young to appreciate the complexity of the story and gameplay; in fact, I stopped playing because it was a slow paced, of what I initially thought, FPS. I was still high on the fast paced shooters like Doom that came a year before it. So I thought it was a step backwards at the time. But as I gotten older, and after overcoming my console phase then returning to good ol’ PC, I was reminded of System Shock when System Shock 2 was released. I got myself System Shock 2 and was blown away. 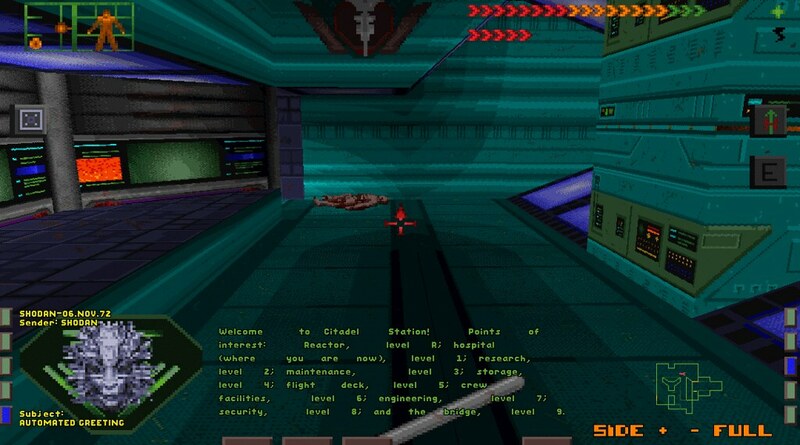 It was at this time where I was already fully transition to both the RPG genre and the PC platform, so I was getting well versed with the control scheme of the PC and the RPG elements of System Shock 2. Thus, I appreciated both the story and gameplay of the sequel. With that, I tried returning to the original game, but the control were already too clunky for me to use. The same clunky controls that stop me from playing Elder Scrolls: Arena and Elder Scrolls: Daggerfall. So, I thought of just foregoing ever playing the original game. But the PC master race gods have smiled upon and me recently and showered me with gifts such as Wasteland 2, Pillars of Eternity (Feels like Bladur’s Gate), and the upcoming Torment:Tides of Numenera. Still, they thought bringing back classic titles to the modern age or making spiritual successors were not enough, they decided to bring yet another classic title to the modern era. Yes. The guys at Night Dive Studios, the same guys that developed System Shock 2, is releasing System Shock Enhanced Edition. Sure, they haven’t totally enhanced every aspect of the game in terms of in game sprites (be it items or enemies, etc. ), they did clean up them up enough to look decent to play again. With that, it supports higher resolutions, though I doubt playing in Nvidia Surround or AMD Eyefinity will be natively supported (not sure if anyone would want to, but I am not just anyone… So I will still try and make this happen because of reasons). The enhanced edition also has support for mouselook, which is an all important update to make the game playable without suffering from the clunky controls of the original. As well as remappable keys… a small bonus, but every gamer has their preference, so this is also a welcome change. Though, I would like to mention that System Shock Enhanced Edition is just available at GOG as of this writing (and currently on sale as of this writing), the guys at Night Dive Studios responded to my tweet mentioning that there are indeed plans on releasing it for Steam, but they do not have a time table as of the moment. So, I will play the waiting game. Here is the link for those interested in getting it in GOG now. 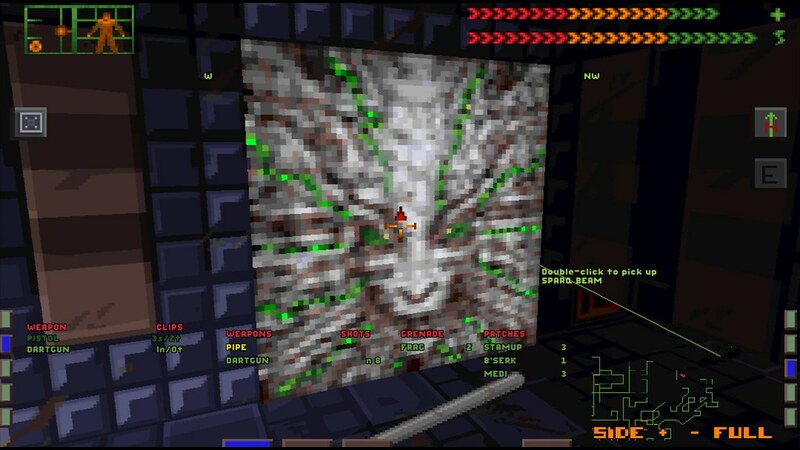 But all in all, this is great news for those people wanting to play System Shock all over again with higher resolution and support on later machines, or for those like me, who never got to really play the original and need not suffer from the odd controls of the original. I cannot wait for it to be on sale in Steam. I mean, System Shock 2 was such an influential game to me and how it depicted cyberpunk (this coupled with Deus Ex made me such a cyberpunk fanatic), that my most recent PC system build is named SHODAN; a homage to the AI antagonist in the game. Will this be a true enhanced edition of the game? Or will it break my heart like what Baldur’s Gate “Enhanced Edition” did to me? Here’s hoping the former will be true.